I was first introduced to Press Coffee two years ago at a collaboration dinner with Chefs Kevin Binkley and Mel Mecinas at Talavera at the Four Seasons Scottsdale. After just a few minutes chatting with owner Steve Kraus, I was impressed with his passion and knowledge. Sipping on a cup of coffee made from roasted Rwanda Musasa beans with their tasting notes of honey and blackberry jam was an eye opener to the world of quality coffee, and it was instantly evident why lauded restaurants such as Binkley’s and Talavera have chosen to pour Press Coffee. 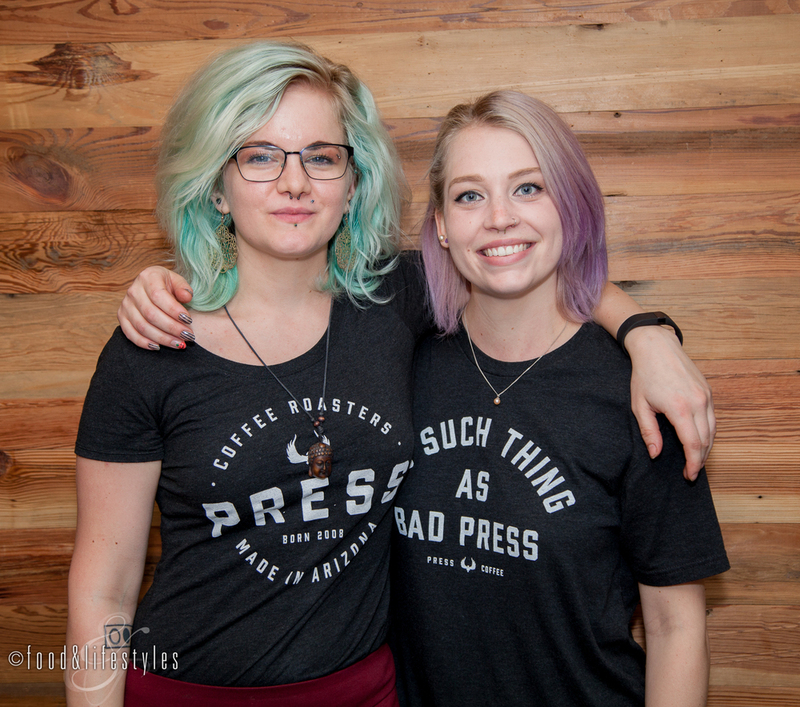 Since then, Press has continued to gain acclaim and garner awards such as this year’s Phoenix New Times Best Coffee Roaster and a bronze medal at the prestigious Golden Bean Awards held in Portland, Oregon. The busy Scottsdale Quarter location was recently renovated and as I sat down to chat with owner Steve Kraus and manager Alex Mason, I admired the setting of crisp black and white warmed with reclaimed wood sourced from the home of the inventor of the ice box. The coffee cherries ripen from green to yellow to red, and can be picked by hand or by machines. "Most of the beans we buy are picked by hand and hand sorted. It’s important that they are picked at the right time because the ripeness of the cherry will dictate how your bean comes out," Alex explains. He goes on to describe the different processing methods. "On one extreme is full washed, where the cherries are thrown into a large vat of water. Based on density, the under-ripe or over-ripe will float and are removed with skimmers. The ripe beans that sink are something we will look at buying. Then mechanical strippers pull off all the pulp, skin, and some of the mucilage, which is the next layer, and you’re left with a little bit of mucilage, some parchment, and some silver skin. They sit in vats for 24-48 hours drying out any remainder and then we’re left with the green bean that we will use. The other extreme is full natural where the cherries are placed on drying beds. The challenge with this process is they can't sit too long on one side because they will over-ferment in their juices, so for the first 48-72 hours, that coffee has to be moved every hour. The coffee will be raked every hour and then moved periodically over the next 4-6 weeks as it completely dries out. In between, there are semi-washes, pulp naturals, and hybrids of those methods. You’ll see full natural in a lot of underdeveloped farms because labor is cheaper than infrastructure, but some of the high-end farms have moved back to full natural and do it really well." Steve points out that "every farm grows and processes differently. To compare it to wine, you can pull grapes from Stag's Leap and have four different winemakers using those grapes but they will taste different. The coffee can be grown in four different regions next to each other, but because of the soil, moisture content, and elevations, coffee can be completely different. It's interesting to know each varietal, but also know what each farmer does and how it is processed. The processing piece of it is really huge." "In their raw state, they are called green beans, and then they are taken to the roasting process, and that inherently is one of the biggest pieces in the execution of providing a coffee drink. Alex has always said, and I agree, that these coffee beans we buy are unbelievably great. From the time that coffee leaves the farm and starts the import process, the only thing you can do is degrade it if you don’t execute things the right way." At Press Coffee, this integral step to superlative coffee flavor is overseen by head roaster Nanda Ibanez at their Phoenix roastery. As we start with a cup of Sumatran Mandheling, Alex shows me a diagram of his favorite tasting wheel with descriptive sections including fruit, chocolate, savory, vegetal, and floral. "Sumatra has its own method of processing." he says. "After they pull the green bean out with the mucilage on it, it sits in water for 24-72 hours. This is called a wet pulling and it gives Sumatran coffee a stew-y, sweet, tobacco note. It's very unique to Sumatra." Steve adds that a "Sumatran is a good gateway coffee to other varietals because it has the similarities of a traditional coffee." Next, we're poured what turns out to be my personal favorite, an Ethiopian Torea, a full natural with more fruit and floral notes on the palate. "Strawberries and cream," describes Alex, and Steve notes "sweet blackberries." As we finish with a cup of Kenyan, Alex tells me this is his ideal flavor profile. He points to an area on the flavor wheel: "I love these savory sweet notes like tomato bisque." Top quality equipment is also essential, as Steve acknowledges. "The execution of providing a coffee drink, whether it's drip coffee, a pourable coffee, an espresso or latte, takes special ways of doing it to ensure you are providing the best cup of coffee possible." He shows me their brand-new espresso machine, a Synesso, made in Seattle, with calibrated measurements for volume, weight, and pre-infusion, ramp-up, and extraction pressures. 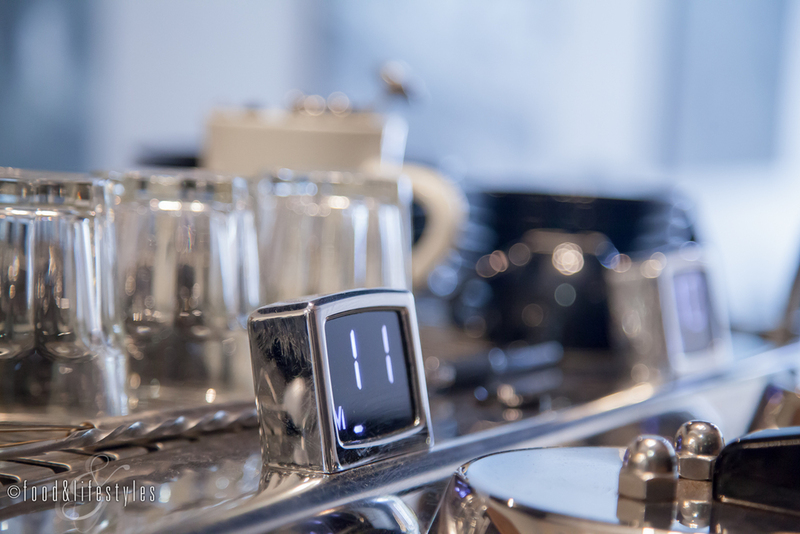 "It's top of the line, with three different motors and shot timers for pours and extractions. This is a beta version and I’m the first one to get it on the market; it's an amazing machine." "These grinders are also calibrated", Steve explains, "so that they extract the exact amount of espresso. It's based on time and pressure." What all this means is that this extremely precise calibration guarantees the perfect balance of flavor with incredible consistency. Next we move on to the sleek-looking machine that produced the cups of coffee we drank earlier. "It's a Seraphim brewer made by Curtis. They’ve been working on taking out the manual process. It’s a pour-over station, and we are one of the first of 50 to get this in the US. It's not all about hot coffee, however, at Press. Steve explains to me the popularity of his Cold Brew. "We’ve been doing it for a few years, but this past year, the middle of 2014 up until now, it’s become huge. People enjoy it because it's smooth and not as acidic. What creates acidity in coffee is heat. Cold brew is brewed at room temperature for 24 hours." "I taste chocolate and peanut butter, and with milk it's like cookies and cream", Alex says. It's easy, delicious drinking and I can see why it's a crowd pleaser. "Now, this is completely different" points out Steve as he pours a Nitro. "We’ve created a nitrogen and carbon dioxide blend and added it into the keg where it sits for a certain amount of days." “We describe this for people who have never had it as kind of like the difference between a cappuccino and a latte," Alex says. "It’s the same ingredients, but the carbonation changes the mouthfeel and it's creamier and sweeter." "We toyed around a few weeks ago and we dry hopped some of our Cold Brew", Steve adds. "We have it down at our Roastery. 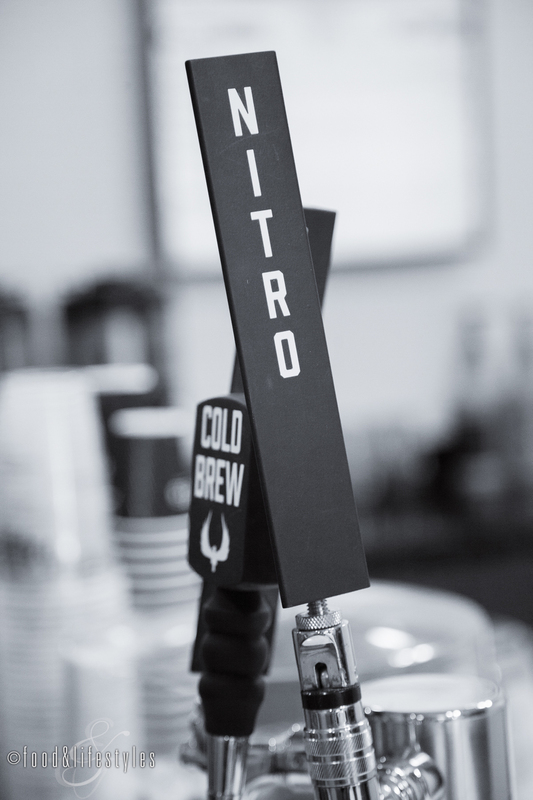 It's very hop-forward; as a nitro it’s really good. We have a nice relationship with a few breweries so we thought we might as well give it a try. We're going to work on it some more and call it a seasonal Hoptro." 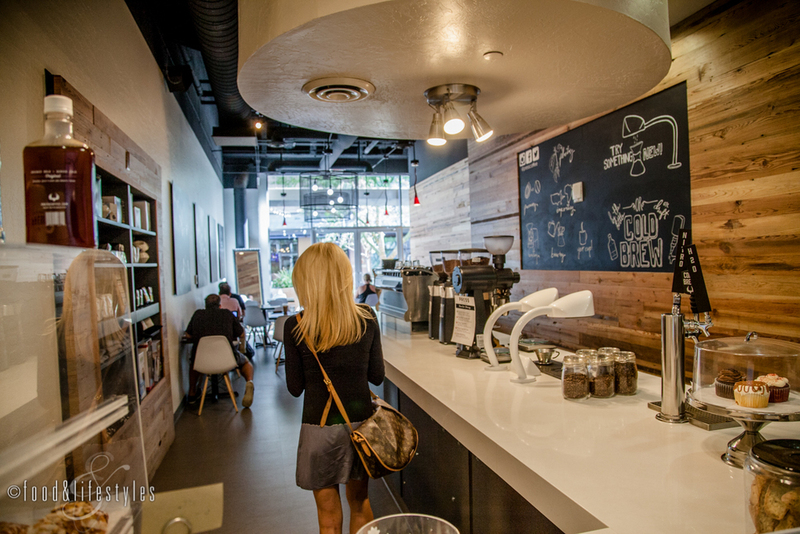 Currently, Press Coffee's locations include Scottsdale, Tempe, and Sky Harbor Airport, and the coffee is served at luxury resorts such as the Canyon Suites at The Phoenician and acclaimed restaurants like Citizen Public House and the Gladly. Fun educational events such as barista classes and tours of the Roastery or cupping experiences are also offered. "I want to be the best", says Steve. "We try to do everything cutting edge but we also educate and train our staff. A very heavy piece of what we do is training. If we don’t have the right people to do it, then we’re missing a step. It’s important that we're consistently making great drinks. I want to know that no matter which Press Coffee someone visits, they are going to walk out with a great cup of coffee." What's in store for the future? "We've recently re-branded everything, from cups, to clothing, to the website", Steve answers. "We're expanding our Roastery from 1200 square feet to 5400 square feet. We've also added a monthly subscription program, where coffee is shipped to customers every month, or you can get one once a week, twice a week, two times a month. We’ll have espresso, Early Edition, our house blend, or Roaster's Choice, which are any of the coffees that our roasters are excited about." Visit any of the locations to see for yourself what Steve Kraus has accomplished at his award-winning Press Coffee, or check the menu at your favorite restaurant.